The deep freeze settling into North Texas means homeowners should take precautions to prevent their pipes from freezing. North Texas dropped below freezing at 6 p.m. and is expected to stay there until Wednesday afternoon. "I almost got caught by surprise with this cold snap," Kirk Johnson said. He spent Tuesday evening covering up his outside faucets. 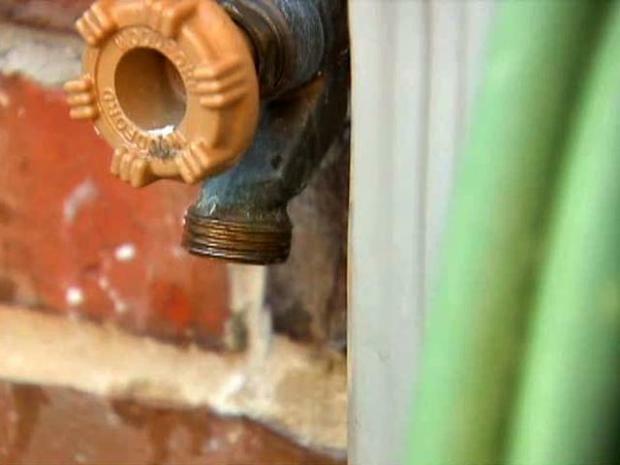 Homeowners are taking precautions to prevent their pipes from freezing. "I think the biggest fear is a pipe breaks someplace where you can't have water, and you will have a lot of damage," Johnson said. Experts say a few inexpensive simple steps can save homeowners big money. "Most of the freeze breaks come from leaving the hose connected to your outside faucet," said Brent Garrett, owner of Star Home Comfort Plumbing and Heating. "You have to disconnect those. They are designed to drain so you won't have any freezing issues." He also recommends insulating pipes in the attic or under the house. "The last thing anyone wants is a pipe to break," Garrett said. "It can cause thousands of dollars in damage." He recommends homeowners run a tiny, slow stream of lukewarm water from any faucets in their house that may be susceptible to freezing. "It's better to be safe than sorry," Garrett said. "Pipes usually break when they thaw, and many times, people are at work when that happens." His most important piece of advice is, know where the home's main water shutoff valve is. "If you do get a break, shut off the water supply to the house and call a plumber right away," Garrett said. "That way you minimize the damage."